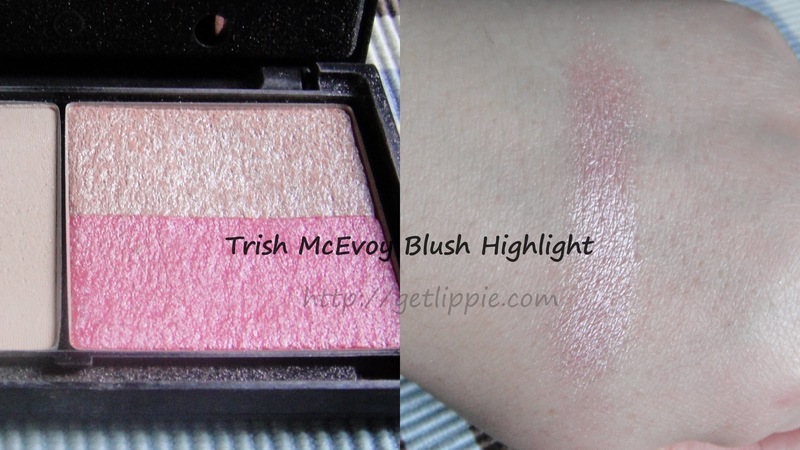 Trish McEvoy Blush Highlight: Oh, this is a pretty one. Yes, it’s a bit sparkly in the pan, but it applies very silkily (is that a word? ), and it adds a very nice hint of colour to your cheekbones. 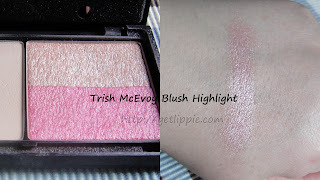 This one is especially good swirled over your blusher, or over a bronzer to bring it to life a little. Now I’ve rediscovered it, I’m going to use it more and more often. I love the colours in my charger, and digging it back out has reminded me that there are a couple of slots free, and I’m thinking I might fill them with some more eyeshadows. Trish McEvoy is a great brand – if you can avoid being sold the ENTIRE RANGE whenever you step near their counters – and I’ll talk to you more about the rest of the things I have from her soon. 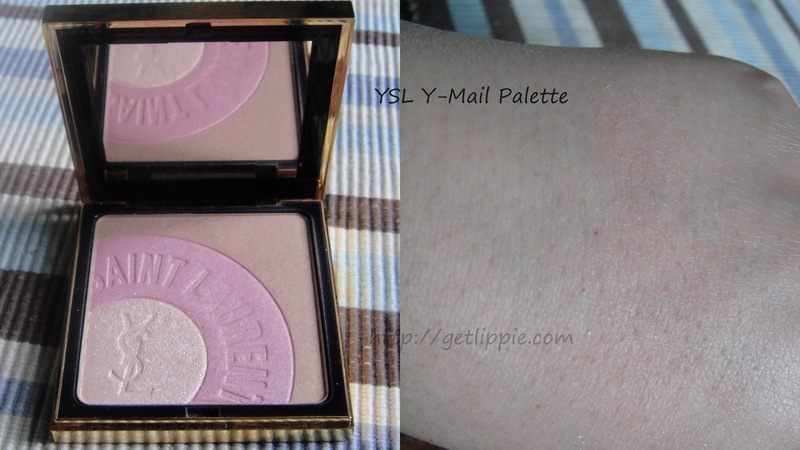 I’ve posted about this one before: YSL Y-Mail Palette. Shall we play a game of spot the swatch? It is there, I promise you, first one to tell me where it is gets a prize! Ironically, even though it hasn’t photographed at all well, I do still like this one a lot, as you can tell from where the lettering has been wearing off! It’s a subtle (if you avoid the glittery bit) brightening powder that just adds a hint of glow to your finished makeup, and stops your foundation looking too cake-y, in the same way a spritz of toner is meant to. I don’t do the toner thing, being a non-believer in it, and also, having a mild paranoia about spraying things on my face. But yes, be wary of the glitter if you go for this one. 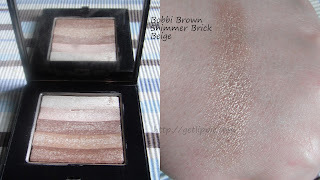 Saving what is probably my favourite for last: Bobbi Brown Shimmer Brick in Beige. I don’t know if you can tell from the pic but this is one battered piece of kit! Several of the strips have fallen out over the years (and it is several years old), have been pushed back in, it’s been dropped – a lot – and it was used practically every day for about three years, as a highlighter and an eyeshadow (can’t do that with a liquid illuminator, alas! ), and it’s still going strong. I thought it wouldn’t be versatile when I bought it, but I was very wrong – I remember thinking “Urgh, beige, how boring!” at the time, but it’s great on most skin-tones, and the addition of the more pinky-golden shades mean you can use the individual strips as brow, cheek or eye colours, should you want to. Highly recommended. I’m away this weekend, so there won’t be any posts – sorry! – but I’ll be back on Monday with some Illuminators that double up as blushers. Have a wonderful weekend! Previous Post Great Customer Service? My Shimmerbrick in Sandstone is my fave higlighter but it's pretty dead now. I looked at Beige and Bronze recently but couldn't decide which one to get. I adore my Bobbi Brown shimmer brick. It really is incredibly versatile. I really wanted one of the mini ones they did at Christmas, but they cost more than a full size!